L.A. Is My Beat: Thanksgiving Potluck? Are you attending a Thanksgiving potluck dinner? Are your friends making all of the standard dishes? Here are a few suggestions that will be sure to make you popular at the party! 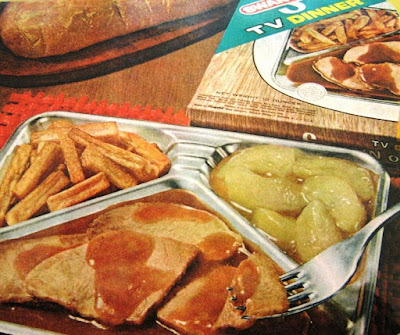 You can figure out the vegie tray pictured above. 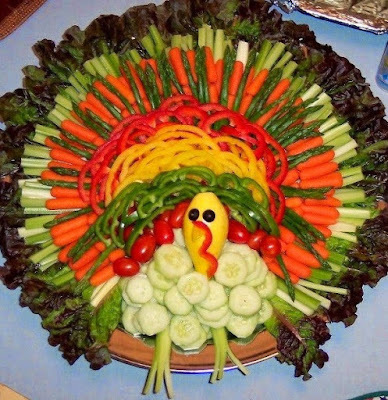 Just cut up cucumbers, green onions, green, red and yellow peppers, zucchini, carrots, celery, asparagus and arrange them to form a turkey! SO CUTE! Serve it alongside the classic onion soup dip and you'll be a hit! My co-worker Rochelle gave me this recipe years ago. 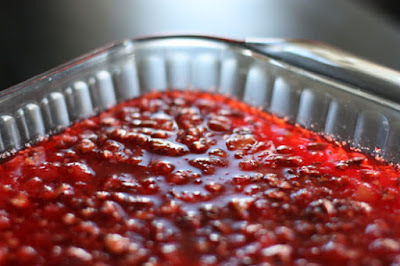 It's a Jellied Cranberry Mold. Rochelle leaves the jello concoction in the bowl for easy serving. It's super delicious! Yes, I know, there's usually cranberry sauce on the table, but this is a special treat! Dissolve the Jello™ in 2 cups boiling (or very hot) water. Add all the other ingredients, mix well and chill...that's it! Rochelle's tip: She usually switches bowls after dissolving the Jello™ since it leaves a grainy coating on the bowl. Next, she adds the cranberry sauce and uses a fork or spoon to really mash it up well (so you don't get chunks of cranberry sauce)...then the crushed pineapple and lastly the nuts. Get some of that Pillsbury Sugar Cookie dough in the deli aisle of your supermarket...you know, the kind you slice down. In the cake section, pick up some squeezable cake frosting in white, orange and black. You'll find candy corn in the candy aisle. Bake the cookies according to package directions. Smoosh a bit of white frosting on the top curve of the cookie, smash in the candy corns. Draw in the eyes, beak and turkey gobbler neck with the proper color of frosting! Done! Proudly serve your Perky Turkey Sugar Cookies! Don't forget the table decorations! 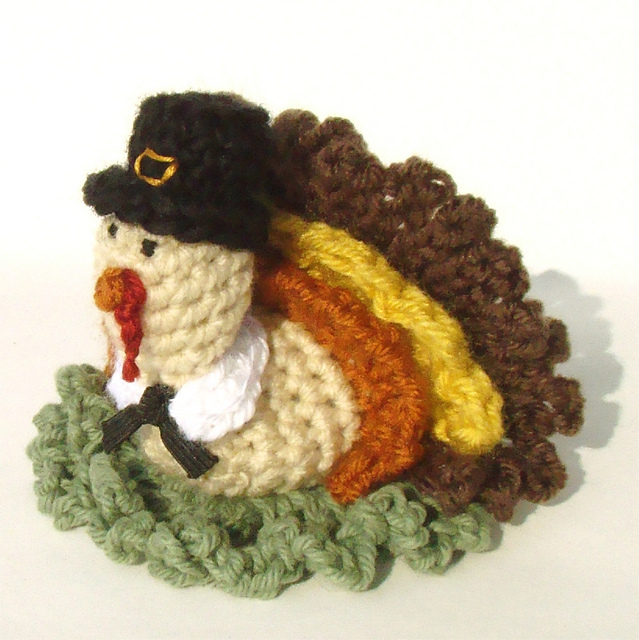 What hostess wouldn't be delighted with a few of these adorable crochet turkeys thrown around the tables? It's a SCRUBBIE! You can use these to clean up and wash the dishes after dinner! 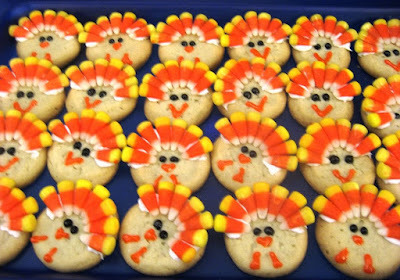 If all else fails, just throw a few of these in the oven and call it a feast!